There’s nothing like a good gig to help you forget the cold weather and the miserable recessive climate. Tonight’s three band bill was certainly value for money and the fact it was my 12 year old son’s first concert merely added to the occasion. Liberty Lies hail from the West Midlands and got things off to a decent start. It was only early in the evening but the Academy was already almost full. The 25 minute set only held my interest for a short while but a fair majority of the crowd seemed quite taken with the band. Not sure if it was something to do with the sound but for me there was just too much going on. The song structures were a little loose and the melodies lacked any kind of substance. Frontman Shaun Richards came across as something of a Brent Smith wannabe but having said that he did have quite a decent voice. Earlier in the day I got the chance to have a chat with Lzzy Hale about the band’s new album and was quite keen to see how some of the songs would translate in the live environment. If I’m totally honest I was actually a bit disappointed tonight. I’ve seen Halestorm a couple of times now and each time was completely blown away. Maybe my anticipation levels were just too high as the set seemed to lack the speciality factor of previous shows. New songs such as ‘Love Bites’ and ‘American Boys’ had great energy for sure but didn’t hit home as I’d been expecting. A new CD to promote means that some songs from the debut will now have to be dropped and I’m afraid I missed the likes of ‘Bet U Wish U Had Me Back’ and ‘Innocence’. With such a short time to impact on the crowd it was also surprising to hear a cover of Skid Row’s ‘Slave To The Grind’. I certainly would have preferred more Halestorm material, even another song from the new CD, as their interpretation added nothing to the original version. Lzzy still commands the stage and has a staggering vocal ability but she seemed at times to be screaming as opposed to singing. Her real talents are emphasised during a superb ‘Familiar Taste Of Poison’, the highlight for me of the 40 minute set. Arejay’s Animal antics behind the drum kit still demand everyone’s attention but even his short drum solo was an anti-climax of sorts. ‘Freak Like Me’ and ‘I Get Off’ brought the rather frantic set to a close and for me it was a missed opportunity to attract some new fans. 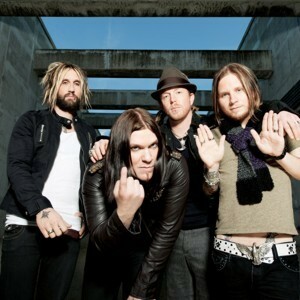 Shinedown’s 2008 ‘Sound Of Madness’ brought the ubiquitous Jacksonville quartet worldwide plaudits and saw their star rise to previously uncharted heights. That the talent and ability was there was never in doubt but the ‘SOM’ set of songs just seemed to tick all the right musical boxes. The band has toured constantly during the last few years on the back of that CD but now with the ‘Amyrillis’ release imminent they have some new material to draw on and showcase. Following a brief intro we are hit between the eyes by ‘Sound Of Madness’ and the crowd go wild. The first thing I notice is how fit the enigmatic Brent Smith is looking these days. He has obviously lost some weight and seems all the better for it. Wearing just jeans and t-shirt, with his hair pulled back into a short ponytail, he looks anything but a star, yet still has the ability to dominate centre stage like some kind of hard rock Messiah. Over the course of the next 90 minutes and 14 songs I’m pleased to say that Shinedown did in fact SHINE. Smith’s vocals have been the subject of criticism at some shows in the past but tonight he was spot on and thankfully kept the preaching to a minimum. Barry Kerch, Zach Myers and Eric Bass lay the musical foundations for Smith’s lyrical machinations and each song, whether old or new, is greeted like a long lost son. Smith seems to have a hypnotic effect on the audience throughout the whole show. When he says ‘Bounce’ they bounce. When he says ‘Shake hands with the person stood next to you’ everyone does just that. The set is a nice mix of up-tempo rockers and mid-paced melancholia including ‘Devour’, ‘If You Only Knew’, ’Save Me’ and ‘The Crow and the Butterfly’ whilst the new songs, ‘Enemies’, ‘Adrenaline’ and ‘Bully’, have a nice energy and their quality bodes well for the new CD. Personal favourites from tonight's show include ‘Diamond Eyes’ and ‘Second Chance’ but by the time the evening climaxes with ‘Fly From The Inside’ I’m guessing the orgasms pertain to everyone’s own individual highlights.